Let the waves hit your feet and the sand be your seat with a trip to the Northumberland coast. A jewel in the county’s crown, it is spectacular whatever the weather. Endless beaches and secret coves, rugged dunes and rock-pools; dramatic cliffs topped with castles, where the ancient Whin Sill splits the land to meet the sea. Probably Northumberland’s most photographed beach, and little wonder! With the brooding ramparts of Bamburgh Castle sitting atop the dunes, and views of the world famous Farne Islands and Holy Island of Lindisfarne out to sea, Bamburgh Beach makes for a dramatic and memorable visit. 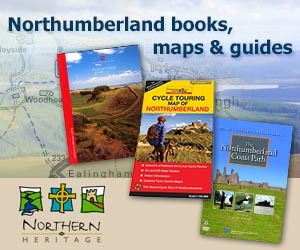 It is easy to see why this was once the seat of the Kingdom of Northumbria. The fine, pale sand of Embleton Bay is steeped in history. On the cliffs above the southern tip of the beach stands the majestic ruin of Dunstanburgh Castle, perfect for photo opportunities; while the northern part is home to the ‘Vanishing Rock’ upon which the name of Scottish pirate Andra Barton is carved, killed in a sea battle with the English in 1511. Ross Back Sands is a remote beach between Holy Island and Budle Bay, entirely cut off from the rest of the coast. It is only accessible by a walk of about a mile along a scenic footpath. The beach has excellent views of Bamburgh Castle and Lindisfarne; on a clear day, it even offers views of the Cheviot hills. Look out for the shipwreck uncovered at low tide. Budle Bay is part of the Lindisfarne National Nature Reserve, home to thousands of birds who congregate at low tide - particularly in winter when thousands of wildfowl and waders flock here. Depending which part of the beach you stand on, you can see Bamburgh Castle, the Holy Island of Lindisfarne and the Farne Islands Nature Reserve. An excellent choice for the adrenaline junkies, Beadnell Beach offers surfing, dune-sledging, kite-surfing, wind-surfing, sailing, and so much more. If you are brave enough, wreck-diving is a great way to explore the murky depths off the coast. Rumbling Kern is a tiny beach in a rocky cove south of Cullernose Point near Howick Hall – home of Earl Grey and the tea that shares his name. A closely guarded secret amongst Northumberland coast connoisseurs, the beach is sheltered behind small cliffs that face inland from the sea. Perfect for a quiet afternoon. From the bustling port of Blyth to the harbour village of Seaton Sluice, Blyth Beach is a huge stretch of golden sand with rich maritime history. It boasts the unique Blyth Battery, a military and local heritage museum housed in the WW1 and WW2 coastal defence buildings on the dunes above the beach. Watch vessels visiting the Port of Blyth from the colourful beach huts, available for daily rental. It is hard to imagine Newbiggin Beach was once so badly eroded by the tide, it had to be restored with thousands of tons of sand brought by ship from other parts of the UK. Now protected by a huge breakwater out to sea, this tranquil beach is perfect for family days out. Walk along Northumberland’s longest promenade, follow the Newbiggin Art Trail; make sandcastles and peer into rock pools. Finish off with a cup of tea and a sweet treat at the Newbiggin Maritime Centre. One of the biggest beaches on the Northumberland coast, Cheswick Sands is a vast space of sand, black basalt rock-pools and dunes stretching as far as the eye can see. Few beaches offer panoramic views such as this. On a clear day, you can see past Berwick-upon-Tweed to the Border and take in views of Holy Island to the south. A fantastic dog-friendly beach to tire out your four-legged friend. Low Newton Beach is picture-postcard pretty. Sitting in a sheltered bay, the jagged outline of Dunstanburgh Castle can be seen in the distance. This sweetly curving beach runs right up to the heart of the village where you’ll find The Ship Inn. If weather permits, relax outside the pub on the grassed square with a fresh crab sandwich and glass of real ale brewed in their microbrewery. Spittal Beach has long been a popular holiday resort. Once a 18th century seaside spa town, the Victorian promenade is still a great place to stroll, taking in the fresh North Sea air and great views of the Elizabethan Walls surrounding Berwick-upon-Tweed. Be sure to look for the red and white stripes of Berwick Lighthouse standing at the end of the pier. The Venetian Pavilion dates from 1928, providing good old-fashion fun with an amusement arcade and café. 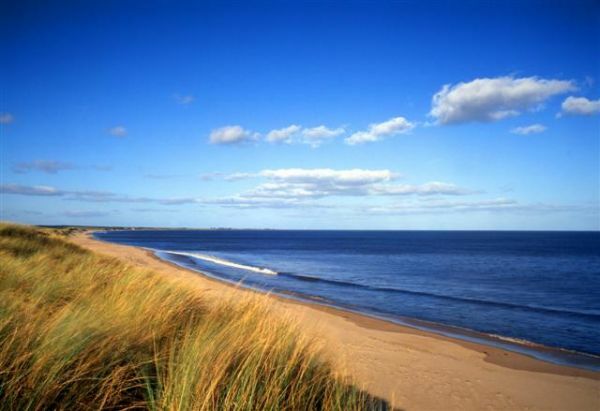 One of the finest beaches in the UK, Druridge Bay stretches seven miles from bustling port town Amble to Cresswell village. Popular with residents and tourists alike, it offers perfect beach walks come rain or shine, summer or winter. Discover wildlife at the newly reopened Hauxley Nature Reserve tucked behind the dunes, and picnic on the shore of the Ladyburn Lake fringed by 100-acres of woodland and meadows. Cresswell is the start point of the Northumberland Coast Path, which follows the coastline for 62 miles (100km) to Berwick-upon-Tweed. Many of the cafés and restaurants, shops and accommodation on the coast are 'Welcome Ports', where you can collect stamps for your Northumberland Coast Path Passport. Collect them all to claim your official 'Northumberland Coast Path Certificate' - a great reminder of your Northumberland holiday!